For several years, my wife Angie and I had talked about planning and taking a trip to Alaska. We had heard of vacations that friends had taken, which were mostly cruises that sounded like great trips, with lots of interesting things to see and exciting activities. We just weren’t sure if a cruise was for us, wanting to do something a little more adventurous. 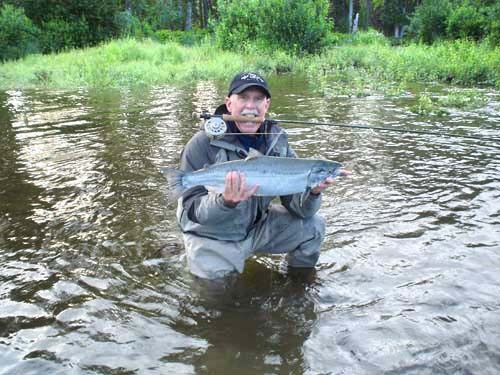 I had always wanted to travel to Alaska to fish, having read many articles and seen pristine pictures of large runs of wild fish, with several different species of Salmon, Trout, and Char. The only problem seemed to be that, most of the lodges that I researched, were just that - “fishing lodges.” There were not many other activities for a couple of which half (my half) was crazy about fishing, and the other half (my wife) which desired to have a variety of activities to choose from. There was one other small obstacle in order for me to get “a complete buy-in” from Angie. That was the fact that we would have to make a forty-minute floatplane flight from Anchorage and land in the Yentna River in order to get to the lodge. After some deliberation, and being assured by Jason, the owner of Wilderness Place Lodge, that if Angie tired of fishing, there were other interesting things she could do. There was photography, have our guide take us sightseeing, or some just plain relaxing and getting some serious reading done. Jason even went so far as to say that she could help out in the kitchen, cooking if she so desired (since after all, this was vacation, I don’t think that was a viable option). However, if one was so inclined it really could be a great opportunity. You would be working with two great chefs, and what a great experience to help prepare four-star meals. So, being the good sport that she is, and wanting to do something a little different and adventurous, we booked for seven days and six nights at the lodge. Before we knew it July was upon us and we departed from San Francisco on Monday, July 21st for Anchorage, Alaska. We spent the first night in Anchorage (having a great King Crab dinner) then the next morning we caught the four-seat Cessna for our flight to our destination. Immediately after leaving Anchorage and heading north, it becomes evident that Alaska is really wild, wild country. There are no visible roads, only waterways as you fly over what’s called the “Muskeg.” The only way that I can describe it is to say it looks like our Sacramento Delta, only much larger. Once the Yentna River was in sight, Scott our pilot made a very steep angle turn into the wind, and we began our descent. The landing was the smoothest I had ever experienced, hardly being able to distinguish when the pontoons actually touched down on the river. We had made it! We continued to taxi on the river to a sandbar, where several aluminum Jon boats with jet drive outboards were waiting for us. Angie later said she thought she had landed on the moon – when she saw the guides outfitted in their waders and wading boots ready to greet the new guests. One such boat pulls next to the pontoon of the plane, and the young man reaches his hand up to help Angie and I while announcing that his name is Jed, and he will be our guide for the week. After donning life jackets, and getting seated, Jed asked us, “are we all set?” We answer sure, and he then says, “hang on,” as he cranks the jet drive and we are whisked away to the lodge. After being greeted at the boat landing, we are immediately escorted to lunch in the main lodge building, for a very nice meal. Jed waits for us to finish and announces that it’s time to go fishing. So off we go to our cabin, to gear up for our first afternoon of fishing. Our one major concern when starting this adventure was that she would get bored, or tire of fishing. I was concerned there would not be enough of a variety of activities to keep her entertained and busy while I was out fishing. Well we fished from 6:00 am until lunch each day, resumed fishing shortly after lunch until 4:00 pm, (in time to get back to get cleaned up for cocktails, and dinner) then back out on the water after dinner until 9:00 to10:00 pm (it stays light until after midnight). It was amazing to watch Angie start out with spinning tackle hooking and playing Salmon, then being encouraged to switch to a fly rod and continuing to catch and land good sized fish. The best part came somewhat late in the week, actually on our last night there. We were scheduled to leave the following morning, and it was our last evening to fish. I was planning to go out, but Angie was going to stay at the cabin. She was just plain tired from long days on the river. 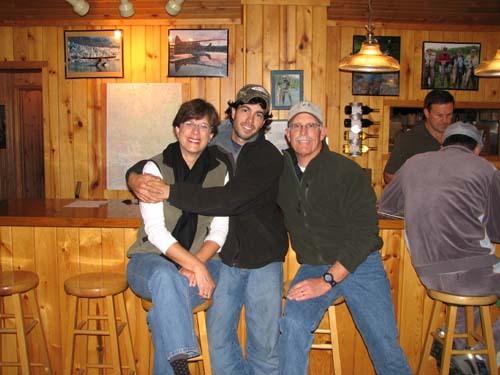 As I was back at the cabin and getting my waders on, she was at the main lodge having coffee when Jed, our guide walked in and asked,” what - you’re not going to fish?” Next thing I knew, Angie ran into the cabin saying, “I’m going. I don’t want to miss anything,” and began to throw on her waders. All in all, we had a wonderful trip, hopefully not a “once in a lifetime trip” because we hope to return to Wilderness Place Lodge. 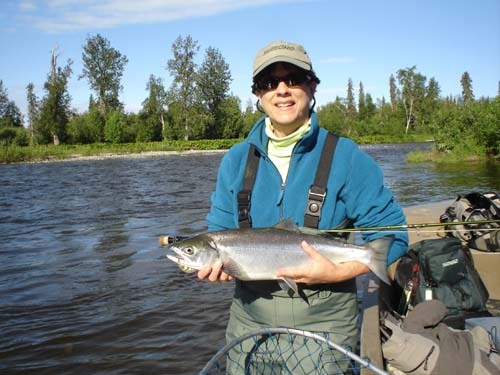 It was everything we had hoped for, the accommodations were great, the food was out of this world, the staff was exceedingly friendly, and our guide Jed, took great care to make sure that we had a great experience both fishing as well as just seeing the beauty of the Alaskan wilderness. I think that in all the years that I have fished, I witnessed what was by far the best catch that was ever hooked! Trig and Angie Birkeland are members of Peninsula Fly Fishers and live in Redwood City. Wilderness Place Lodge, Lake Creek, Alaska, www.wildernessplacelodge.com.